Looking to make a big impact in young lives? Regent's Bachelor of Science in Early Childhood Education, offered fully online, will prepare you to make a difference in the care and well-being of children. Presented from a Christian worldview, this unique program provides a comprehensive study of both education and business operations so that you are equipped to provide excellent, affordable care for young children. Discover how children from birth through age 8 develop, and shape curriculum to help them thrive. Introduction to current issues in education and various facets of the Elementary educator’s role. The course includes an observation of PreK-6 classes to assist students in evaluating their qualifications and motivation for teaching. Students distinguish required state and national assessments as well as competencies necessary for licensure in Virginia. Includes supervised field placement. Prerequisite for upper level UIS and UED courses. Pass/No Pass. (This course designated for Early Childhood Program). Emphasis on environments, which nurture the development of socially competent young children. Cultivating pro-social behavior and development expectations for very young children. Examines good nutrition, safety, and healthful practices for young children; provides students with the knowledge and skills to operate a safe, healthy childcare environment. Designed to expose human service students to ethical fund-raising in human services, including annual and capital campaigns, telemarketing, special events, direct mail marketing, face-to-face solicitation, e-fund raising, and grant writing. Presents models and methods in evaluating, monitoring, and implementing human services programs. Includes an overview of funding, developing budgets, and monitoring expenditures. Development of math, science, and social studies skills in children; strategies for facilitating children’s learning; exploration, play, and creative expression in the areas of art, music, and movement for children. Establishing, administering, and managing early childhood programs; professionalism, program development, implementation, and evaluation; various models and theories of early childhood education programs; Commonwealth of Virginia licensing and staff requirements. Learning disabilities, intellectual disabilities, emotional disorders, and the characteristics of students with hearing, vision and/or physical impairments. Survey the range of conditions, which contribute to students being eligible for special education services. Presents an overview of identification, assessment, program options and intervention services. (This course is designed for Early Childhood Education Program). Practicum experience in early childhood classroom settings; placement in high-quality early childhood environments under the supervision of experienced mentor teachers and faculty coordinators; practice micro-pedagogy and dialog with professionals regarding program operations. Because students will be working with children, student background checks will be required. 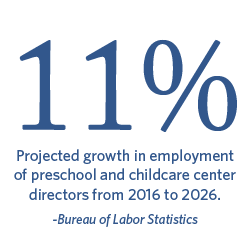 Employment of childcare workers is expected to grow by 17 percent from 2013 to 2022. The B.S. in Early Childhood Education is not a route to a Virginia teacher licensure. Those seeking teacher licensure should consider the B.S. in Interdisciplinary Studies (PreK-6).